Some people fancy petting dogs and cats, but if you are into fish, then you’ve clicked on the right review. Not only can fishes act as an ideal addition to the family, but they can enhance the atmosphere of your living space with their brightly colored scales. However, going to the pet shop and getting your beautiful decorative fish is not enough. You also need an affordable and high-quality aquarium, which can complement your fish and enhance its beauty. It also has to make sure they stay under comfortable and healthy condition. But in today’s modern advancements in technology, it’s definitely not easy to choose the right aquarium that can fit your needs. So, let us help you out a bit on that. The MarineLand aquarium might just be your pick like it was ours. MarineLand Aquarium Reviews: What sets it apart? Where does the MarineLand Contour Glass Aquarium Kit fall short? The MarineLand Contour Glass Aquarium Kit boasts an amazing array of features that can make any marine life enthusiast happy. 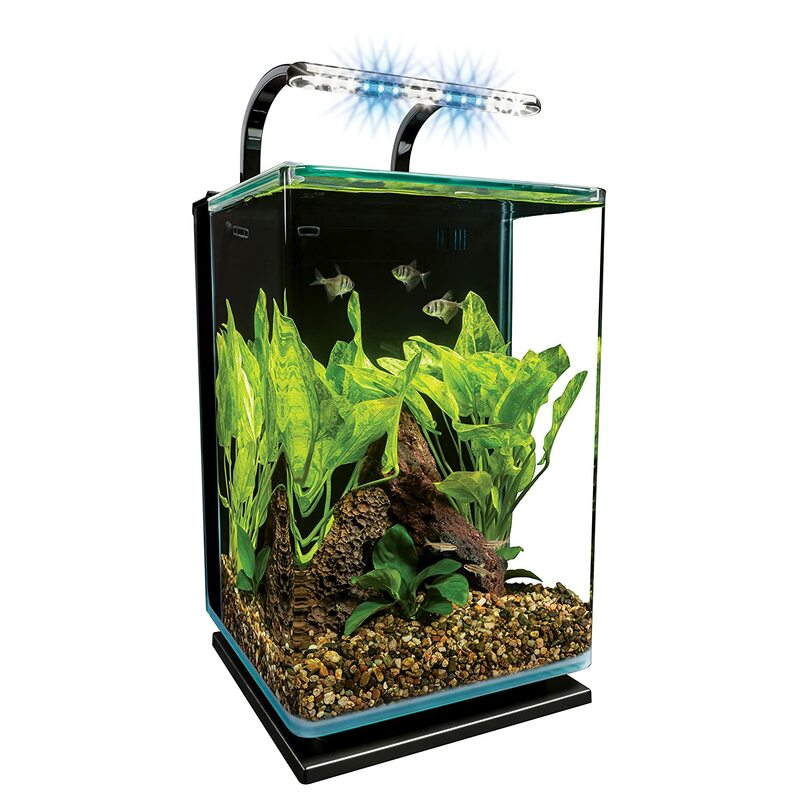 Starting from an easy to assemble kit to rail light features, this aquarium can produce a unique hypnotic effect that can soothe any work environment of an office space. For an aquarium kit for the beginner, we felt that the MarineLand was quite generous with their 5-gallon water capacity. Even though it means that you might not be able to store a lot of fishes in it, but for a beginner, it is more than enough. The compact and easily accessible size allows for easy cleanup of the tank, which turn out to be quite a major problem for bigger aquariums. The portable nature makes it ideal for those who would like an aquarium but don’t have very much space for it. An aquarium has the power to create a very soothing atmosphere. Not only do colorful fish help in calming the nerves, but also in creating a more holistic workspace. But these effects can be severely diminished if the tank does not get proper lighting. This is why the MarineLand is equipped with fantastic LED rail lights that shine a great beam onto the fish so that everything can be beautifully illuminated. Additionally, for greater convenience, the light rail can be set for daylight settings, which makes the resulting light ray white. The moonlight setting, on the other hand, shines a somewhat soft blue beam onto the aquarium. Most aquarium companies don’t look to minimize manual cleaning in their products. But that was not the case with MarineLand, as their filtration system is unique and was able to delight us with its design thoroughly. The MarineLand has a 3-step filtration process that effortlessly made sure that the water is clean and free of toxins for the fish to thrive in. The filter pump installed is highly efficient and automatically cleans the water periodically. It even comes with an extra filter cartridge. Through a 3-step filtration process, MarineLand will leave no stone unturned when it comes to your fish, as they have also integrated 2 types of filtration: biological filtration for the aquatic plant life, and chemical filtration for the microbes. 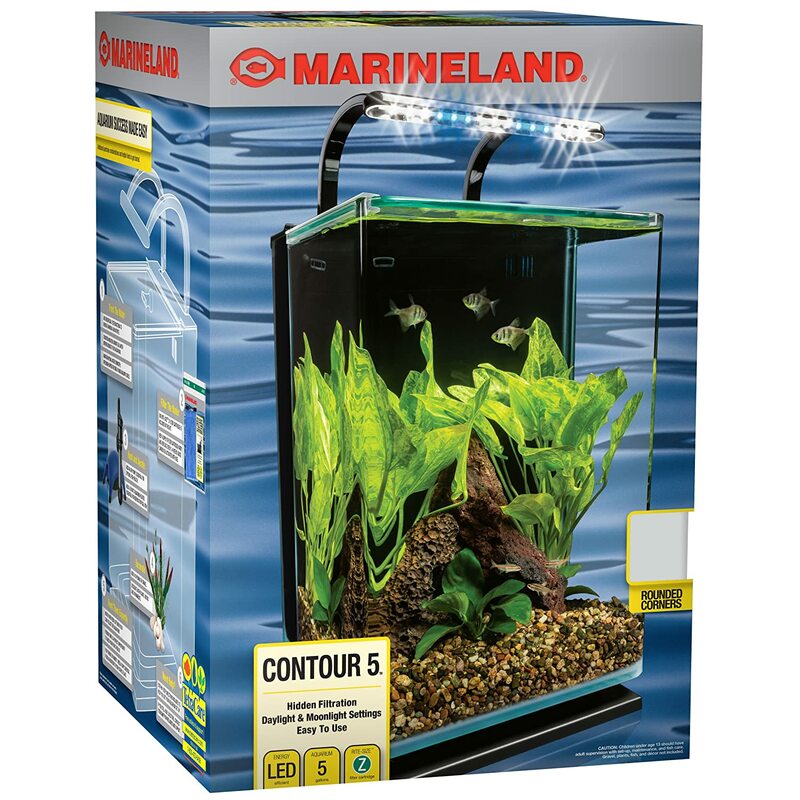 As this aquarium is built while keeping the beginner fish enthusiasts in mind, the MarineLand Contour Glass Aquarium Kit is quite easy to set up. After placing the substrate, plants, water, and fish into the tank, you can simply insert the filter cartridge into the pump, plug it in and turn it on, and you are all good to go. The MarineLand Aquarium Kit has a lot of amazing features that cater to a lot of customer needs. But there are a few instances in which we felt that it fell off the wagon. Primarily, the 5-gallon water capacity may feel insufficient to the more experienced aquarium owner, but it’s perfect for a beginner who is just setting out. And secondly, the back chamber is a bit cramped, and may not house a more powerful pump if you wish to change the one initially provided. The MarineLand Contour Glass Aquarium Kit in all respects is the perfect fish tank for any beginner or for any marine life enthusiast who wants some fish but doesn’t want the hassle of a massive fish tank. We sincerely hope that our aquarium review today helped you with some of your fish troubles. Go ahead and buy it with your eyes closed.